"A co-workers wife gave me this recipe and it is one of my favorites. 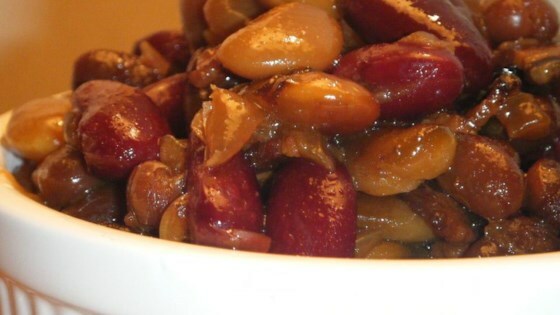 This four bean dish is perfectly seasoned, and makes a wonderful side dish." Place bacon in a large, deep skillet. Cook over medium high heat until evenly brown. Drain, crumble and set aside. Reserve 2 tablespoons bacon fat. Add onions to fat in pan, and saute until soft. Stir in garlic powder, dry mustard, wine vinegar, and brown sugar. Simmer for 20 minutes. In a large pot or slow cooker combine bacon and onion mixture with the kidney beans, lima beans, butter beans, and baked beans. Mix together, and simmer for 70 minutes. See how to take boring beans and make them suddenly exciting! This is one of my favorite side dishes of all time! It works well in a slow cooker, too. Excellent!!! As a male my wife would prefer I not eat beans. "understandable" These tasted great and did not upset my tummy at all. She ask me to fix them again soon. I have a very similar recipe that I received from a farm cookbook years ago. It includes a pound of hamburger. It makes an excellent main dish.